Life is a balance and balanced life massage helps to harmonize body, mind and spirit to bring about an equilibrium and integration of all of the body systems. The respiratory system, our source of vital energy is activated, the nervous system is soothed and the muscular system is stimulated to release tensions and toxins. The rhythm of life is gently re-established as the body relaxes, renovates and rejuvenates. Balancing, relaxing and invigorating massage, helps to eliminate stress and tension from the body with gentle pressure soothing and stretching tired muscles with the use of essential oils. Working with the reflex points in the feet with a light pressure to achieve inner balance, and optimum health. Reflex points help to relieve tension, detox body and stimulate circulation and digestion. Slow and sensitive balancing massage using large and gentle global movements to relax and align. Created in the famous Esalen institute of human potential in California U.S.A., inspired in classical massage technique and energetic principles of oriental massage. Relaxing full body massage with special fragrant Cleopatra oils of mirhh, incense and rose to deeply relax, re-balance and rejuvenate. Gentle Body peeling with dead sea salts followed by a relaxing and rejuvenating massage with special fragrant Cleopatra oil. Treatment is completed with a facial massage including gentle cleansing, light peeling, nourishing serum and balancing facial mask. A combination of gentle stretches to ease and release joint stiffness with gentle traditional thai massage technique to relieve muscular tension resulting in greater flexibility and relaxation. Regenerating facial massage includes gentle cleansing to remove toxins and impurities, light peeling, reaffirming anti-ageing serum, digital pressure point massage and balancing face mask with nourishing sea algae for dry skin or for reaffirming with clay from the dead sea. Relaxing massage for the shoulders, neck, head and face, helps to eliminate tensions, toxins, and fatigue as well as to improve circulation, concentration, and wellbeing. 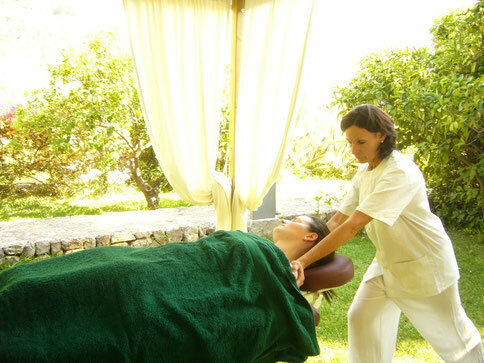 This massage is performed with the recipient dressed, sitting and with no oils. Traditional Abhyanga massage effectively balances, relaxes and energizes. Rejuvenates the skin, tones the muscles and eliminates impurities. Essential oils used for individual doshas or body constitutions. Integrate body, mind and spirit with a massage based on ancient yogic healing techniques to relax, balance, energize and awaken the consciousness. Ancient yoga healing technique designed to alleviate stress and tension and to increase prana o vital energy and to aid in creating total body balance. Receive the anti-oxidant benefits of the grape with this relaxing massage which employs the use of warm wine pindas or poultices made from grape seeds, pulp and skin with flavenoids and polifenoles to deeply relax muscles, combined with soothing and stretching massage techniques to stimulate the circulation with grape seed oil. Relieve muscular aches and pains, stiff neck and shoulders or tension in lower back. Massage includes gentle streches and pressure points to ease muscular tension, realign and rebalance the body. Slow and gentle relaxing massage designed to stimulate the elimination of toxins and accumulation of liquids. Ideal for swollen and heavy legs with poor circulation, especially relaxing and rejuvenating for the face. Energetic massage focused on the problem areas of cellulite accumulation. Massage treatment employs thermal creams and marine algae wrap to help absorb fat. Reflex points activated in the feet to stimulate the endocrine system. Minimum recommended treatment 10 - 12 sessions for visible results. Gentle massage to alleviate chronic pain. Relaxing aromatherpy to soothe body and mind combined with slow global stretches linking different zones of the body for a balancing and renewing effect. Reiki "Bio-energetic Hands on Healing"
Healing with the hands is as timeless a therapy as the history of mankind. Feel the soothing effect on body, mind and spirit, the holistic approach to healing as energy is channeled into your body to balance the chakras and the electro -magnetic field and to elevate spirit. Profound massage treatment combining traditional therapeutic massage technique with vibratory effect of the tibetan bowls, for balancing and harmonizing body, mind and spirit. Synchronize the many complex systems of the body and fortify your ability to live a life of glowing health, vigor and happiness. Harmonyum assists in raising the body´s vital energy and sets the entire mechanism of the body and mind in rhythm while soothing the heart and integrating and balancing the physical body, mind and emotions. Harmonyum is essential for maintaining optimum health as it purifies the system of the destructive effects of negative thinking and feeling, while raising the consciousness in order to think and act positively and thereby creating a positive impact on health. The aromas of natural essential oils have a profound penetrating effect on the central nervous system producing a relaxing and sedative effect on mind, body and spirit. The smell perception is based in the hypothalamus, in the central nervous system, which is the principal regulator of body activity and metabolism. The massage with essential oils is beneficial because of the different effects of the aromas balancing, stimulating or pacifying. The essential oils also have many other properties such as, antiseptic, anti-spasmodic, anti-inflammatory as well as renovating and stimulating cell growth. Oil fragrances may be the fastest way to achieve physiological and psychological results in balancing body and mind.